Ionia (/aɪˈoʊniə/; Ancient Greek: Ἰωνία, Iōnía or Ἰωνίη, Iōníē) was an ancient region on the central part of the western coast of Anatolia in present-day Turkey, the region nearest İzmir, which was historically Smyrna. It consisted of the northernmost territories of the Ionian League of Greek settlements. Never a unified state, it was named after the Ionian tribe who, in the Archaic Period (600–480 BC), settled mainly the shores and islands of the Aegean Sea. Ionian states were identified by tradition and by their use of Eastern Greek. Asia Minor/Anatolia in the Greco-Roman period. The classical regions and their main settlements, including Ionia. The geography of Ionia placed it in a strategic position that was both advantageous and disadvantageous. Ionia was always a maritime power founded by a people who made their living by trade in peaceful times and marauding in unsettled times. The coast was rocky and the arable land slight. The native Luwians for the most part kept their fields further inland and used the rift valleys for wooded pasture. The coastal cities were placed in defensible positions on islands or headlands situated so as to control inland routes up the rift valleys. The people of those valleys were of different ethnicity. The populations of the cities came from many civilizations in the eastern Mediterranean. In the Indian (e.g. : Tamil) historic literary texts, the Ionians are referred to as "yavana" or "yona", and are described as wearing leather and wielding whips. 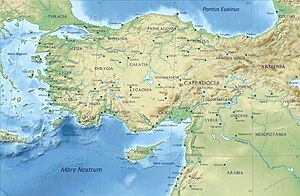 In modern Turkish, the people of that region and the Greeks were called "yunan" (plural "yunanlar") and the country that is now Greece is known as "Yunanistan". From the 18th century BC the region was a part of the Hittite Empire with possible name Arzawa, which was destroyed by invaders during the 12th century BC together with the collapse of the Empire. 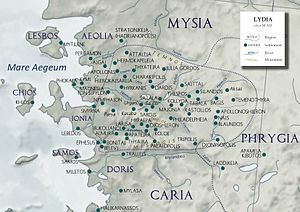 Ionia was settled by the Greeks probably during the 11th century BC. The most important city was Miletus (the Millawanda/Milawata of Hittites). Several centuries later Ionia was the place where Western philosophy began and was the homeland of Thales, Anaximander, Anaximenes and Heraclitus. They were natural-philosophers of the Ionian School of philosophy and tried to explain the phenomena according to non-supernatural laws. They also searched a simple material-form behind the appearances of things (origin) and this conception had a great influence on the early archaic art in Greece. During the late 13th century BC the peoples of the Aegean Sea took to marauding and resettling as a way of life and were called by the Egyptians the Sea Peoples. Mycenaean Greeks must have been among them. They settled lightly on the shores of Luwian Anatolia often by invitation. In the background was the stabilizing influence of the Hittites, who monitored maritime movement and suppressed piracy. When that power was gone the Luwian people remained in the vacuum as a number of coastal splinter states that were scarcely able now to defend themselves. Ionian Greeks took advantage of opportunities for coastal raiding: an inscription of Sargon II (ca 709–07, recording a naval expedition of 715) boasts "in the midst of the sea" he had "caught the Ionians like fish and brought peace to the land of Que Cilicia and the city of Tyre". 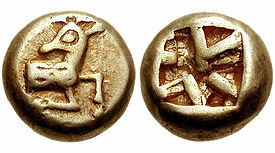 For a full generation earlier Assyrian inscriptions had recorded troubles with the Ionians, who escaped on their boats. 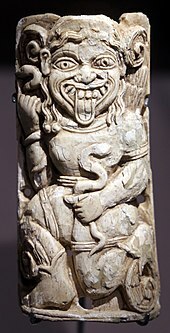 Gorgone with serpent, Ionia, 575-550 BC. Ionian cities appear to have retained a considerable amount of freedom until the qonquest of Asia Minor by Alexander the Great. Ionia became part of the Roman province of Asia in 133 BC. Ionia has a long roll of distinguished men of letters and science (notably the Ionian School of philosophy) and distinct school of art. This school flourished between 700 and 500 BC. The great names of this school are Theodorus and Rhoecus of Samos; Bathycles of Magnesia on the Maeander; Glaucus of Chios, Melas, Micciades, Archermus, Bupalus and Athenis of Chios. Notable works of the school still extant are the famous archaic female statues found on the Athenian Acropolis in 1885–1887, the seated statues of Branchidae, the Nike of Archermus found at Delos, and the objects in ivory and electrum found by D.G. Hogarth in the lower strata of the Artemision at Ephesus. The Persian designation for Greek is Younan (یونان), a transliteration of "Ionia", through Old Persian Yauna. The same is true for the Hebrew word, "Yavan" (יוון) and the Sanskrit word "yavana". The word was later adopted in Arabic, Turkish, and Urdu as well as in other places, such as Meniscus. ^ Smith, William (1857). Dictionary of Greek and Roman Geography: Volume II Iabadius-Zymethus. London: Walton and Maberly. pp. Ionia pages 60–61. ^ "Ionia". Encyclopædia Britannica. 1911. ^ a b Sargon's inscription in A. Fuchs, Die Inschriften Sargons II aus Khorsabad (1994:40) noted in Robin Lane Fox, Travelling Heroes in the Epic Age of Homer, 2008:29f. ^ Guide to Greece Book 7 Sections 5–7. ^ "Encyclopedia of Ancient Greece". Retrieved 31 December 2014. ^ Breder, Jan (26 October 2012). "Ionia". The Encyclopedia of Ancient History. John Wiley & Sons, Inc. doi:10.1002/9781444338386. ISBN 9781405179355. OCLC 230191195.